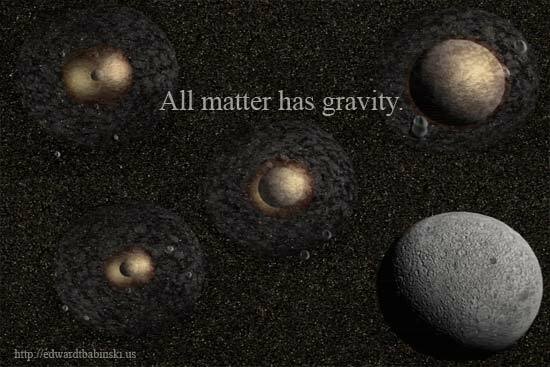 Formation of planets, and perhaps the moon begin with loose matter, pulled together by force of gravity over millions of years according to one theory. Five billion years ago there was no sun, nor earth, nor moon. All that existed of our galaxy was a cloud of intersteller dust and gas. It consisted mostly of helium and hydrogen, and bits of dust —mixed together with tiny grains of heavier material that had remained from dying stars. The cloud was lumpy having an area within, a denser collection of material than others. Since the gravitational force exerted by any object depends on its mass, the gravitational force exerted by this relatively high-density area was correspondingly greater than those surrounding it. Consequently, it would tend to pull more material toward it, further increasing its mass. As a result, its gravitational force yet increases and even more matter pulled into the thickening cloud. Eventually, the most massive region of the cloud would begin pulling everything toward it and the entire cloud collapse. The second thing that would happen, like an ice skater that draws in her arms as she goes into a spin, the cloudʼs rotation speeds up as it decreases in size and increases in density. Download Formation of the Moon in wmv format. Animated visual spanning the millions of years when the moon was a mere dustcloud and formed into the sphere we know today. Right click on “Save Link As” and download. The Moonʼs low density (3.3 g/cc) shows that it does not have a substantial iron core like the Earth does. Moon rocks contain few volatile substances (e.g. water), which implies extra baking of the lunar surface relative to that of Earth. The relative abundance of oxygen isotopes on Earth and on the Moon are identical, which suggests that the Earth and Moon formed at the same distance from the Sun. Various theories had been proposed for the formation of the Moon. Below these theories are listed along with the reasons they have since been discounted. The Capture Theory: This theory proposes that the Moon was formed somewhere else in the solar system, and was later captured by the gravitational field of the Earth. The Moonʼs different chemical composition could be explained if it formed elsewhere in the solar system, however, capture into the Moonʼs present orbit is very improbable. Something would have to slow it down by just the right amount at just the right time, and scientists are reluctant to believe in such “fine tuning”. Also, this hypothesis does not have a natural explanation for the extra baking the lunar material has received. The Condensation Theory: This theory proposes that the Moon and the Earth condensed individually from the nebula that formed the solar system, with the Moon formed in orbit around the Earth. However, if the Moon formed in the vicinity of the Earth it should have nearly the same composition. Specifically, it should possess a significant iron core, and it does not. Also, this hypothesis does not have a natural explanation for the extra baking the lunar material has received. Between four and five billion years ago an apprentice planet the size of modern Mars, and three times its mass, failed its orbital driving test and smashed into the molten Earth, dislodging a huge divot of magma. Most of it fell, like a golfers divot, back to Earth. But enough of it cleared the gravity of Earth to coalesce and eventually form the big cheese we love today. Evidence for this far fetched tale is significant. Studies of the geology of the moon indicate that it has no recent volcanic activity that would indicate that it has its own mantle. The rocks of the Moon are essentially the same as cooled igneous rock from the mantle of Earth. Seismic studies of the Moon have found that Primary waves carry through the center, indicating that there is no molten metal core. Celestial bodies that formed at the start of our solar system all seem to have iron cores, even asteroids. So far, no other explanation of the cold, crusty Moon fits the data. Questions still persist. For example, if the Earth had been smacked hard enough to lose such a big piece of mantle, the impact would have made the Earth spin about twelve times faster than it does today. Imagine two hour days! If that happened, what could possibly have made the Earth slow down to 24 hour full spin cycles? Galileo was responsible for naming the major features on the moon. You may know that he was the first person to study the night sky using a telescope. He thought the dark, smooth areas were seas, and called them “maria” (Latin for seas; “mare” is the singular). For instance, the first Apollo landing occurred in Mare Tranquilitatis (the Sea of Tranquility). Of course we know now that there are no seas. The “seas” look flat from ancient lava flows. But the names stayed. This page was designed and tested by Night Owl using GTMetrix on 6/17/2017.